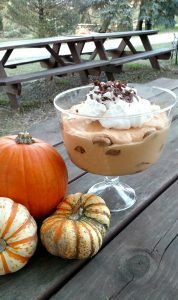 Okay, we didn’t sacrifice a pumpkin from the patch to make this dessert, although we COULD have. Yes, went with canned pumpkin from the store. Somewhat embarrassed but sometimes one has to go with what is easy. Can’t find mascarpone cheese at your grocery? Neither could we. But, we found good substitute using cream cheease, butter and whipping cream. What we learned in going with that substitute . . . probably need to blend a bit longer so all the cream cheese is incorporated. We had a few lumps of white cream in our dessert, but can confirm that we didn’t get any complaints at all.